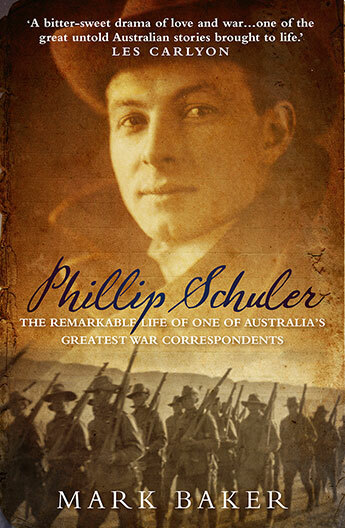 The definitive biography of Phillip Schuler, one of Australia's greatest war correspondents, from Gallipoli to his death in Flanders. Phillip Schuler, a handsome young journalist from the Melbourne Age, covered the Gallipoli campaign alongside Charles Bean. His bravery was legendary. His dispatches were evocative and compassionate. He captured the heroism and horror for Australian newspaper readers in ways the meticulous yet dry prose of Bean never could. Gallipoli would also propel Schuler on a collision course with his former friend and Age colleague Keith Murdoch, who made his name lobbying against the campaign after a brief visit to Anzac. After his classic account of the campaign, Australia in Arms, was completed in early 1916, Schuler abandoned the relative safety of a correspondent's job and joined the AIF as a humble soldier. In June 1917, he was killed in Flanders. He was 27 years old. Mark Baker's meticulously researched account of Schuler's brief but extraordinary life gives us a true insight into the man. As a correspondent, a lover and a soldier, Schuler left an indelible mark on all who encountered him. He was a shining light of the generation decimated by the war. Baker's biography gives us a new and compelling perspective on the power of journalism and Australia at war. Mark Baker is a former Senior Editor of The Age, editor of The Canberra Times and Managing Editor (National) of Fairfax Media. During 13 years as a foreign correspondent for Fairfax, News Corporation and the Financial Times he had postings in China, Hong Kong, Thailand, Singapore and Papua New Guinea. He covered the wars in Iraq and Afghanistan and was wounded while reporting the civil war on Bougainville in the early 1990s. He has also served as Political Editor and Canberra Bureau Chief of The Age. A former president of the Melbourne Press Club, he is now the Club's inaugural chief executive officer.